Swimtag and Brain Sentry were the winners at the 2015 Sports Technology Awards, at an event where wearable tech companies dominated the nominations. The event, which is in its second year, is set up to recognise the technology that's playing an increased role across sport – be it tracking, broadcasting or participation. Wearables had two dedicated awards – best wearable for performance and best wearable for measurement. 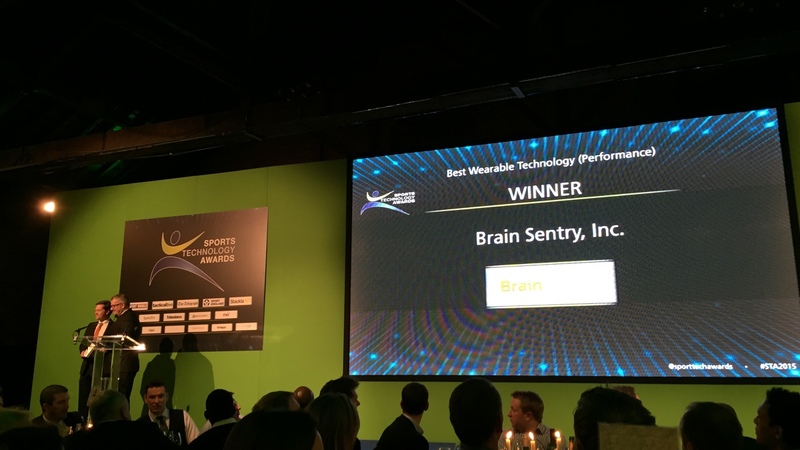 Brain Sentry picked up the gong for best performance wearable, and was recognised for its role in improving safety – in a year where concussion and brain injuries have been thrown into the spotlight, both in the NFL and rugby. It pipped both Polar and Zepp to the award, both of which had strong years in 2014. The award for best measurement wearable was packed with big name nominees, as Garmin, TomTom and Catapalt Sports all fought it out. However, they were all to be disappointed, as the judges picked Swimtag – a wearable in use at local pools that enables people to track their lengths and review their data online after. And it wasn't just fitness trackers and GPS watches getting nominated. O2 was also picked out for the best use of technology by a sponsor, for its use of Oculus Rift in its Wear the Rose campaign for the 2014 Six Nations – where fans could experience a first person perspective of an England Rugby training session.